Harry & David is reinvigorating its brand with interactive initiatives, a refreshed catalog, and online offerings for its 75th anniversary. The Pop-Up Orchards aim to unveil the new selections in a fresh, unique way. Objective: Harry & David is reinvigorating its brand with interactive initiatives, a refreshed catalog, and online offerings for its 75th anniversary. 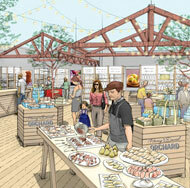 The Pop-Up Orchards aim to unveil the new selections in a fresh, unique way. Idea: For the first time, Harry & David will bring its farm-to-table offerings to 16 of the country's busiest cities from now through the holidays. Tools: Direct mail pieces, catalog inserts, and frequent e-mails are being used to notify existing customers about the activities and opportunities to shop at the pop-up stores. Scott Huddleston, VP of multichannel marketing, says the company has submitted store details directly with Google and Yahoo and is syndicating listings with smaller local search engines. He added that Pop-Up Orchards is working directly with Yelp to have enhanced listings with store details and a biography to support the stores in major metropolitan areas. Measurement: Financial results are going to be measured based on sales and profit generated by each of the stores while they are open. Additionally, the Pop-Up Orchards are viewed as an opportunity to both influence customers and capture consumer information in an urban environment where the customer profile differs from that of core customers. Driving future sales from these customers through online channels and other brick-and-mortar stores in the area will be a longer-term objective that may not be initially measured by the sales performance of the stores while they are open.